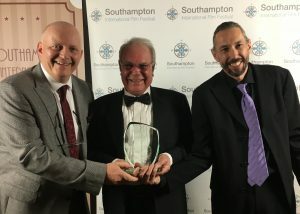 Our film „Shattered Night – Zersplitterte Nacht“ won the award for the best editing at the Southampton International Film Festival 2016. A moment of joy and great thankfulness we lived together with Richard Benson, the grandson of murdered Richard Berger. The drama “Shattered Night – November 9th 1938, when the night was at its coldest…”, tells the true story of the president of the Jewish community in Innsbruck, Richard Berger, who was brutally murdered by the Nazis during the “Night of Broken Glass 1938”.